This button copies the IPTC Locations to a 4 level keyword. 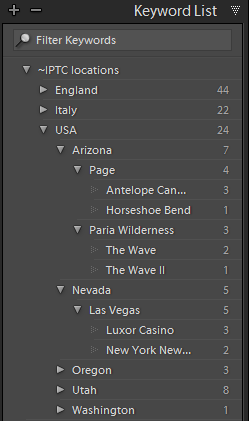 Here for example you can see how the location fields from the above picture of The Wave have been transformed into a keyword structure - ~IPTC locations > USA > Arizona > Paria Wilderness > The Wave. This has a couple of purposes. The immediate one is so that location fields like country and city are also included as keywords when you export the pictures. This saves you from having to enter the information in both places - you enter location data in the correct place and then just run the plug-in. Metadata entry is more efficient. That image will also get the parent keywords - Page, Arizona and USA. 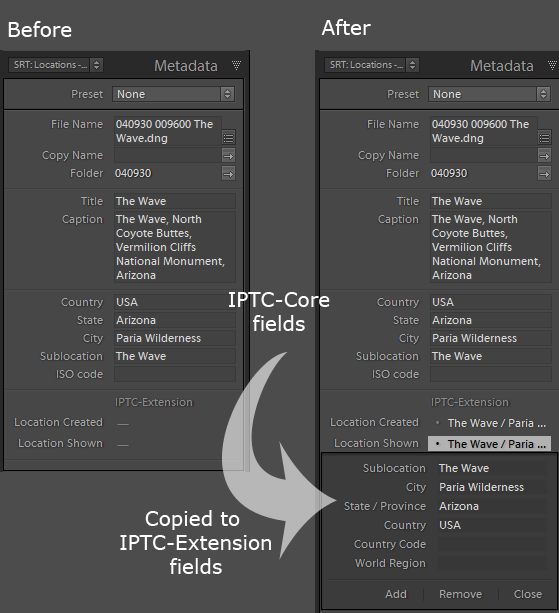 This tick or drag & drop method is much quicker than typing each entry into the corresponding fields in Lightroom's Metadata panel. Data entry is more consistent. If I have been to Vegas before, I can see I used "Luxor Casino" for and so can avoid entering a different name such as "Sphinx" for new pictures of that location. This last button "closes the loop" and copies the top 4 levels of the special "~IPTC locations" keyword over to the corresponding IPTC locations fields in the Metadata panel. So you can use ticking or dragging and dropping to assign images to locations - you'll like this if you've used iView/Expression Media - and you then quickly update the Metadata panel fields using this button. Of course, if you choose to place Arizona at the country level of keywords, the command will assign Arizona as the country. So it's important to follow the 4 level logic: ~IPTC locations > USA > Arizona > Paria Wilderness > The Wave. However, you may choose to have extra levels. So for example, if we take the 4th level (location) keyword "Luxor Casino", one might want to add a 5th level with keywords such as "Indoors"or "Outdoors". Then a 6th level might include more specific parts of the complex such as "Hotel lobby" or "Penthouse suites". This may be useful if you are an architectural photographer and need to manage your locations efficiently while also being able to find all your pictures of hotel lobbies. These extra level keywords are regular keywords in every respect, so they will be exported and can be used to find pictures. But they cannot be written back to the IPTC location fields because they are only 4 levels.